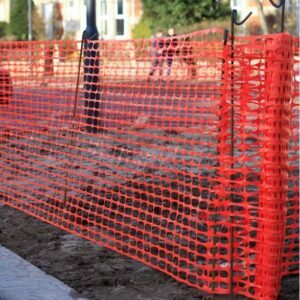 Safety barrier to quickly cordon off hazardous areas. Also used for construction sites, sporting events and crowd control. High-density polyethylene (HDPE) is a stretched and high tensile mesh and is resistant to damage such as tearing, making it ideal for construction sites. Is this orange plastic fence suitable for outdoor use? Yes, HDPE is UV, rot and water resistant which is why it is often favoured for sporting events or construction. It is also light in comparison to other products, making transport to events much easier. How do I set up the product? Setting up this product is very quick and easy. Simply unroll the barrier and attach it to a series of fencing pins which you would have planted in the ground. How many fencing pins would I need? This would depend on the size of the barrier you have in mind. As a guideline, when setting up the barrier, you should attach it to a new fencing pin every 5m.